I certainly had no intention of capturing this photo when I went out on a brief walk one chilly December afternoon. My only goal was to get a picture of something, but I didn’t know what that would be. This time of year there’s a dearth of colors in nature, and on an overcast day like this one the world almost looks like it’s being displayed through a sepia filter. This splash of green caught my eye though, and when I looked closer and saw the little tendrils poking out from the side of its leaves I knew I had found my subject. The hard part, then, was figuring out how to shoot it in such a way that one of the wisps would be isolated against the rest of the plant. 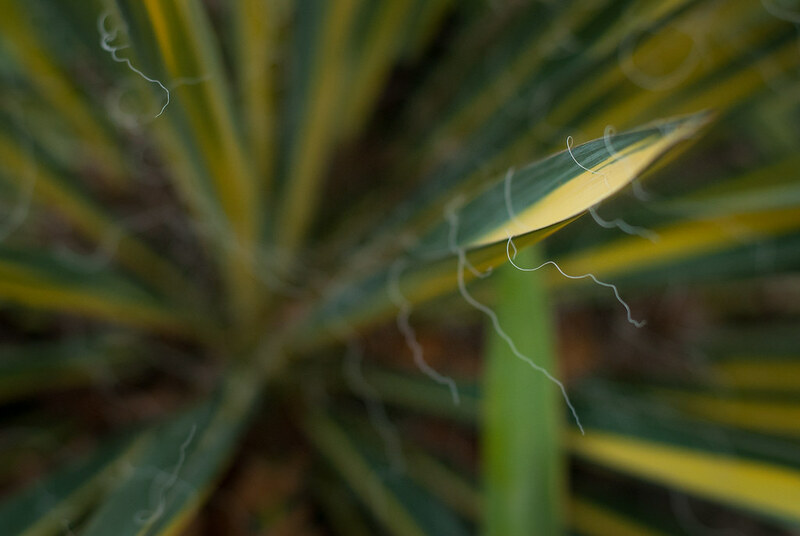 I ended up shooting this at f/2.8 (1.8 would have resulted in a depth of field that was simply too shallow, while f/4 or smaller would not have been able to isolate just one solitary strand like this) using manual focus, and it worked out pretty well. I don’t know anything about yucca plants, but I must say, if they can stay green through the winter then I’m already kind of sold on them. When I was a kid, we dug up a cactus down in Texas and transported it back here to Nebraska. As you well know winters here can be harsh, but that old cactus lived and thrived here. I imagine that the same goes for that yucca plant, although the next time you have it pose for a picture, politely ask it to shave first. Those whiskers are horrendous! Yep, and that hardy thing lived forever! Us kids avoided that thing like the plague because of its razor-sharp needles! We finally dissected it one day to see if it was true, like in the old cowboy movies, that that cactus had juice in it. It did, and we tasted it, spit it out, and left that poor plant to pass away to the Great Cacti in the Sky! There was once a Lincoln band known as Cactus Hill created by Bobby Settel.